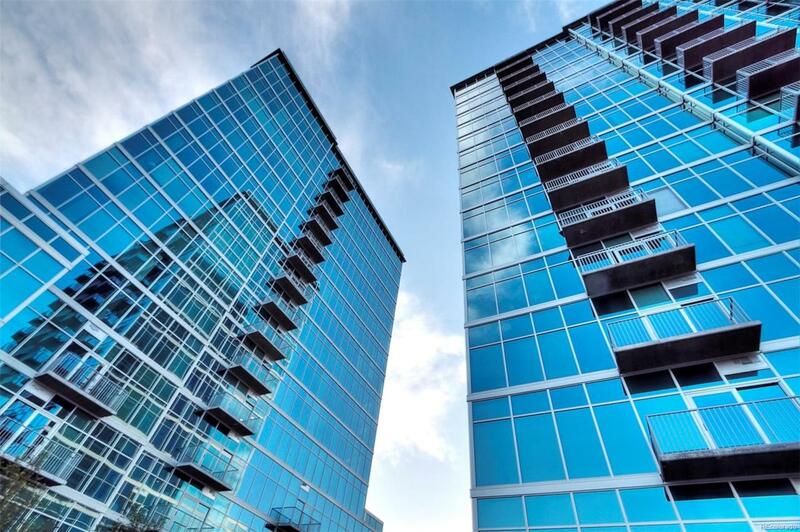 Offering impeccable views of the mountains and Commons Park, youll love the floor to ceiling windows that remind you of what downtown living is all about. A sweeping overhead soffit & accent lighting highlight the open floor plan featuring hardwood floors, industrial concrete, stylish cabinetry, sleek countertops & black subway tile add punch to the contemporary kitchen. The master bedroom offers a large walk-in closet, with a full tub and shower. The condo comes with reserved parking, a sizable storage unit, along with all the amenities the Glass House has to offer: 24/7 concierge, gratis athletic club membership including spin, yoga & other fitness classes. The Glass House has one of the best outdoor pools in Denver as well as a beautiful community terrace. This Riverfront Park neighborhood home lays claim to the ultimate location to access Denvers premier sights: Union Station, LoDo, the South Platte River Trail & countless restaurants, bars and sporting venues.